US, 1997, 134 minutes, Colour. Robert Duvall, Miranda Richardson, Farrah Fawcett, Billy Bob Thornton. Euliss Dewey, known as 'Sonny', is a travelling evangelist with a popular clientele in the American south. He grew up attending black church services and has absorbed their spirit. He is a persuasive preacher and, no matter what his sins, he is a true believer. However, he has been voted out of his church of which he was a co-founder. His wife, Jessie, is involved with another minister. Sonny arrives at a baseball game and attacks the younger man then fears that he has killed him. He leaves town, and ditches his car in a lake. He then prays that God will call him to be an apostle. He rebaptises himself. He calls himself 'The Apostle E.F.' and moves to Louisiana to begin his ministry. To support himself, he works as a short-order cook and has a radio program for preaching. His centre is the One Way Road to Heaven Holiness. The police are searching for him when Jessie hears him on the radio. In the meantime he has confessed to a fellow-preacher (and is overheard by his partner, Sam). When the police do arrive, he is preaching powerfully but, at the end, he gives himself up to them. Robert Duvall once attended a revival meeting and was fascinated. He also felt that many of the subsequent preachers whose meetings he attended had not been fairly treated, especially by the media. So, he wrote the screenplay for The Apostle and directed it and gained an Oscar nomination for his performance. It is not so much a critique of revivalist religion and of the credulity of so many who attend the meetings with their enthusiasm, their singing and dancing, the prayer and tongues and their belief in healings. However, Duvall is sympathetic in his portrait of Sonny, a man who has a gift for preaching, loves prayer and loves his ministry. And the screenplay is in no way condescending to the range of people, generally poor and without benefit of much formal education, for whom this kind of religion is a joy and a comfort. Though Sonny is obviously a Christ-figure in his capacity to pray and uplift, he is a mixture of goodness and sin. This sinfulness is not underplayed and Duvall makes Sonny a complex figure, amazingly honest in his goals and in his performance and as sincere in his acknowledging of his violence and guilt. There are some fine supporting performances from Farrah Fawcett as his estranged wife and Miranda Richardson as the radio station secretary he befriends. An important aspect of the plot plays beneath the final credits. 1. The impact of the film? Evangelical Christianity? The portrait of this Christianity, how critical, how sympathetic? Themes of belief, salvation, prayer, redemption? 2. The opening in Texas, 1939, the revivalist meeting, the apostle and his presence, his nanny, his family, his preaching sessions when he grew older? The background for the character of The Apostle? The Hispanic congregation, the woman translating and moving just like the preacher? 3. The present, Texas, homes, towns, the various churches, revivalist centres? Transition to Louisiana? 4. The musical score, the range of hymns, well-known, not so well known? The contribution to the atmosphere? The Apostle and his singing? 5. Audience response to Evangelical Christianity, beliefs, sympathies, the style of prayer, tongues, dancing? The black communities? The poor communities? Revival and faith healings? 6. Sonny, his age, experience, personality? His explicit language of faith and Jesus as personal saviour? His convictions? The car crash, going to the man at the wheel, his words of comfort, his words of faith, the response of the man? The police looking on? 7. Sonny and his ministry, the church? His travelling? Jessie, her relationship with her husband, the children? Horace and Sonny’s trust in him? The adultery? Sonny coming to the house, throwing the can? The baseball game? The children? Horace present, Sonny getting the bat and hitting him? Rough with the children? Realising what he had done, fearing that Horace was dead? His leaving? The visuals of him at the crossroads, his prayer? Sinking the car in the lake? Tearing his book of addresses, singing on the bridge? 8. Sonny and his personal prayer, mad at the Lord, his relationship with his mother, travelling with her? Her singing, her religious background? The disputed the church, Jessie wanting the church, the meeting with the council, the vote ousting him? His leaving? The visuals and Jesse, her playing the piano, running the church, the congregation? His mother’s death? 9. His view of Satan putting a wedge between his family? Explaining that he called his children “beauties”? Encountering the fisherman, kindly man, his story? Sonny living in the tent? 10. Jessie, the voice-over on adultery? 11. Sonny and his travels, on the bus, seeing the blessing of the fleet and his openness to all religions? His fixing the car and his abilities as a mechanic? 12. Searching out and meeting the old pastor, wanting a new church, C. Charles Blackwell, the discussions, asking why Blackwell should trust? going to visit the church, Sonny happy, taking over? 13. Sonny and his radio ambitions, calling himself the profit E.F? Meeting Toosie at the radio station? Her interest? The manager, the interview, his not wanting any speaking in tongues? The money issue? Sonny, his verve, his radio broadcasts like a revivalist meeting? 14. Meeting Sam, working on the cars, Sam and his friendship, believing in Sonny? Going to the meetings? Growing in faith? 15. Sonny’s wondering about the family, his mother’s collapse, in hospital, not able to ring her because of the police? His friend back home, support? His mother’s death? 16. Toosie, the attraction, inviting her to dinner, prayer of crease before the dinner, sharing with her, her story, ex-husband and the boys, taking her home? Her not being ready for the sexual encounter? Her being part of the congregation? 17. The group fixing up the church, catching the bus, collecting the group of the faithful, taking them to the church? 18. Phoning Jesse, praying for Horace? His being in a coma? 19. The service, Psalm 150? Continuing on the radio, the piano? Delivering the food to the poor? The born-again people, the river immersions? 21. The picnic, joyful, the stranger arriving with his truck, Sonny putting his Bible in front of the grader, defiance, the response of the stranger, others putting their Bibles down, the conversion experience, confession, weeping? The radio manager and his broadcasting the experience over the radio? 22. Talking over his future with C. Charles Blackwell, Blackwell and his wife, trusting Sonny, participating in the worship after his retirement? Sam, overhearing the conversation about what Sonny had done? Wary? Yet at the final ceremony, the conversion experience, kneeling and weeping? 23. The final service, entrusting the future to the community, to Mrs Blackwell, the police at the back, waiting for him to finish, Sam and his acceptance, the witness? 24. Sonny, owning up to what he had done? The optimism of his working with the road gang and getting them to proclaim the name of Jesus? 25. 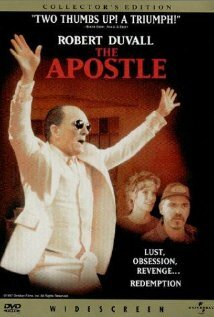 Robert Duvall’s work, writing and directing, his interpretation of Evangelical Christianity, his strong performance?